The holiday sale has SOLD OUT! The YourErie.com Golf Pass will go back on sale in mid-January. 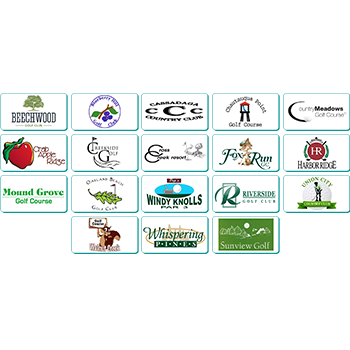 With the purchase of the YourErie.com Gold Card valued at OVER $300, you get the opportunity to play one round of golf at each of the 17 golf locations highlighted on the golf card PLUS you get 2 large buckets of balls for the driving range at Sunview Golf. Cart rental is not included. All of this value and fun for a special holiday price of $89 - a little more than $5 a round!! This makes a great gift for someone special to enjoy a season of touring the local links! Card is Valid on non-holidays Monday thru Friday (anytime) and Saturday and Sunday after 12:00 PM. Must call ahead for tee times and availability before use. Not valid with any other offers, coupons, tournaments, outings, or league play – a round equals 18 holes at 18-hole courses and 9 holes at 9-hole courses. Only a limited quantity of these are available at this holdiay pricing. Card is valid on non-holidays, Monday thru Friday (anytime) and Saturday and Sunday after 12PM. Must call ahead for tee times and availability. Not valid with any other offers, coupons, tournaments, outings, or league play. A round equals 18 holes at 18-hole courses and 9 holes at 9-hole courses.